THE WORLD FAMOUS CHIOS MASTIHA Chios Mastiha is a product unique to the island of Chios, enchanting people with its exceptional aroma and particular flavor. 1 product. 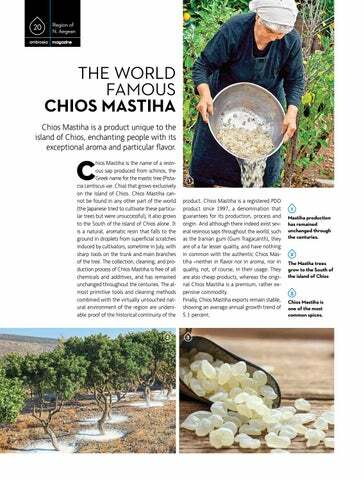 Chios Mastiha is a registered PDO product since 1997, a denomination that guarantees for its production, process and origin. And although there indeed exist several resinous saps throughout the world, such as the Iranian gum (Gum Tragacanth), they are of a far lesser quality, and have nothing in common with the authentic Chios Mastiha â&#x20AC;&#x201C;neither in flavor nor in aroma, nor in quality, not, of course, in their usage. They are also cheap products, whereas the original Chios Mastiha is a premium, rather expensive commodity. Finally, Chios Mastiha exports remain stable, showing an average annual growth trend of 5.1 percent. 1 Mastiha production has remained unchanged through the centuries. 3 Chios Mastiha is one of the most common spices.